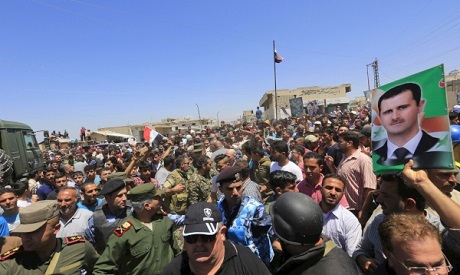 The remaining fighters started to withdraw from the last rebel-held enclave in central Syria on Wednesday, state television reported, sealing the government's control over the area and opening a major stretch of the country's most important highway. Often brokered by Assad's Russian allies, such agreements have in recent years become a defining characteristic of Syria's seven-year war. They have displaced over 100,000 people - rebel fighters and civilians. The opposition has called it a policy of forced displacement amounting to demographic change to force out Assad's opponents. The Syrian government has said nobody is forced to leave and those who stay must accept state rule. Having held the area being evacuated on Wednesday for years, rebels agreed earlier this month to withdraw along with their families and other civilians who did not want to come back under Assad's rule. Since the enclave straddled Syria's main north-south highway in the stretch between Hama and Homs, recapturing it will significantly ease communication lines in government areas.